Building an excellent credit score allows you to borrow money, secure rental leases, and pay lower insurance premiums. But many students have thin credit reports or poor credit due to past missteps. Or, even more common, students and young adults don’t have credit simply because they’ve avoided it and now, after graduation, they need to build their credit scores. For example, I had a family member this year try to buy a house. He had enough for the down payment but was having difficulty getting pre-approved for a mortgage because he had no credit history. He only used a debit card his whole life, paid cash for his car, and simply never had a reason to take out a loan. As a result, he couldn’t qualify and needed to take a few months and build up his credit score. If this sounds like you, and you need to build or improve your credit, consider becoming a member at Self Lender. Self Lender is a free credit score monitoring system that allows their members to open a Credit Builder Account. A Credit Builder Account is a low cost loan that you essentially make to yourself that allows you to build savings and your credit. 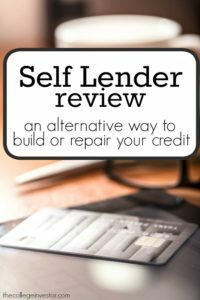 Even better, Self Lender does not require a credit check. But before you open a loan, these are the things you should know. Self Lender partners with two companies who offer products that you can use to build your credit score. People with established credit can find credit card and personal loan offers through Credible. Self Lender also offers credit products to people with bad credit or no credit. Self Lender has a unique relationship with multiple FDIC insured banks. Through the partnerships, they offer Credit Builder Accounts. Credit Builder accounts help people who need to build their credit through installment loans. Think of a Credit Builder Account as a reverse loan. You pay the payments first, and you get the money afterward. Since the account is structured as a loan, you build credit as you make payments towards your account. All of your loan payments are reported to all three credit bureaus, which should report the loan on your credit report. You could see it as a forced savings program. But it’s better to consider it a controlled environment for building credit. Since you get the money at the end instead of upfront, you maintain the incentive to make timely payments. If you’ve got poor credit, a Credit Builder Account may be among your only credit options. Self Lender does not have a credit check. They only check that you haven’t fraudulently shut down any checking accounts. When you open a Credit Builder Account, the bank opens a Certificate of Deposit in your name. You can choose a CD for $525, $545, $1,000, or $1,700. For 12-24 months, you pay level payments to the bank. Self Lender reports each of the payments to all three major credit reporting bureaus, which should reflect on your credit report. Once you complete your payments, you get a mature CD. You can prepay the loan without penalty, but making a loan payment on time is the single best way to improve your credit in a hurry. The account is a double-edged sword. If you fail to make the payment, your credit report will show a late or delinquent payment. Looking for a CD? Check out our table on the best CD rates. Is Self Lender’s Credit Builder Account Free? A Credit Builder Account is not free. Even though you don’t get access to the funds up front, you will pay up to 16% interest rate on the loan (the interest rate varies by product, but it does not exceed 16%). You also have to pay a $9-15 fee to open your account, depending on account type. The Credit Builder Account is not free, but it is a low-cost way to build credit. Remember, the alternative is probably to use a secured credit card, in which case you would need to deposit some amount (typically $200) to get started. So this is a much lower cost approach to building credit. Can I Build My Credit For Free? The Discover It® Secured Credit Card and the Capital One Secured Mastercard are cards with no annual fee, and low security deposits. However, they charge interest if you do not pay your bill in full each month. Compared to secured cards, Credit Builder Accounts offer a controlled environment, and it requires less cash upfront. If you feel confident with your credit, then a secured credit card may be the best option for you. But a Credit Builder Account can help you stay on top of your behavior while helping you build your credit. How Should I Build My Credit? I recommend that everyone should build their credit as quickly and cheaply as possible. If you can trust yourself with a credit card, then that is probably your cheapest option. But, not everyone feels comfortable with a credit card or they have a hard time being approved for a card (or don’t have enough cash available to apply for a secured credit card). If you prefer the discipline of a savings secured loan, then opening a Credit Builder Account through Self Lender is an excellent first step. In personal finance, behavior and math both matter. You need to choose the option that is right for you. 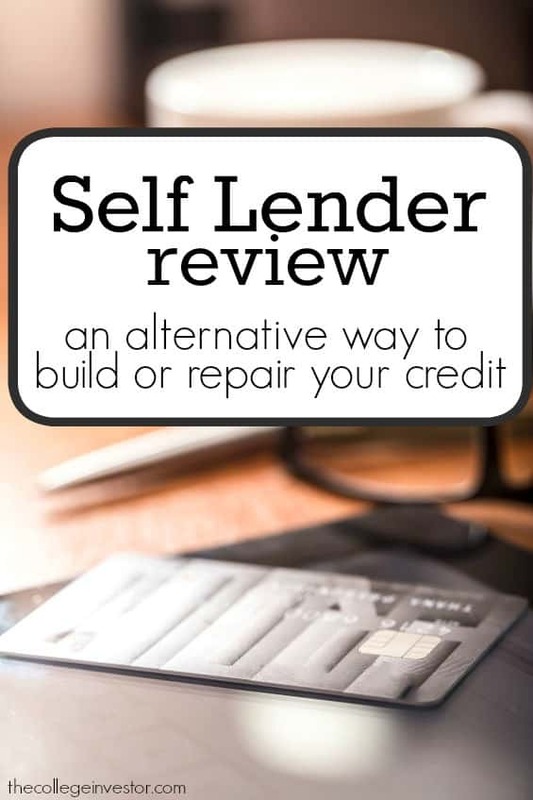 If you’re interested in learning more about the Credit Builder Account, visit Self Lender today. Would you use a service like Self Lender to build credit? This is a neat and low-cost way for someone with no credit to get started! It’s a shame that people who prefer a “no debt, no financing” approach to finances are penalized by not using credit products, but I guess it makes sense for the ones doing the lending to make sure that you are capable of making timely payments regardless of your income. Right – it’s such a catch-22! If you are responsible and never use credit, there is no “proof” on paper you’re responsible. On the flip side, when you do need it, they want that proof. I don’t recommend this to everyone. 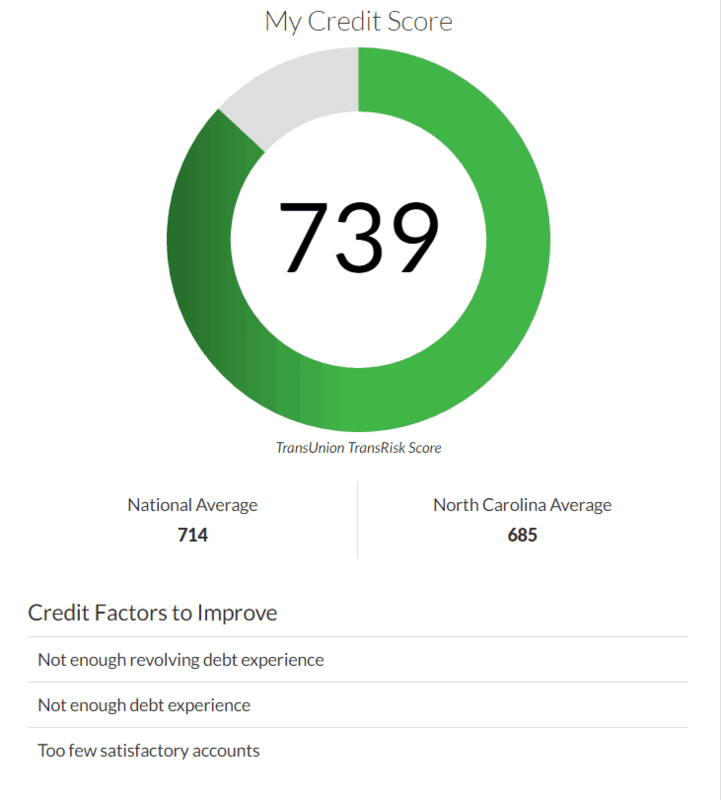 I have a very good score and after Self Lender posted it to my report, my score went down 30 points (same with my husband for 18pts). So now I need to bring the 30 points to my score for a year while paying them the damn interest. How I wish I didn’t join. Remember, if you have a higher score, opening a line of credit will lower it. However, once you’ve paid it off, it will rise above where it was previously. If you have a low score, the downside isn’t much, and the upside is very high. I recently filed a chapter 7 and want to rebuild my credit. I went yesterday to my meeting of the creditors. After researching different options. I believe this would be the best fit for me especially being a single mother of 4. How long do I need to wait before applying for a credit builder loan. Do I have to wait until my debt is discharged or can I do it now since Ive already went to the court to meet with creditors. You should wait until everything is finalized by the courts. after a year of saving will i be apply to close the account withou penalty.. i know with credit cards it lower your credit score will it do the same or is your contract over after the year? This is different in that this is a loan – like a car loan. It is good to pay it off. So let’s say I have an extra $500 ( with very little credit/ trade lines). Would it help my score to do this loan and just pay it off in 3 months ? Yes, any time you get a loan and pay it off it will help your score. If i open an account can I pay off the loan sooner then the 12months period. Lets say im suppose to pay $50 for the next 12months could i do 75 or 100 and pay it off faster. would it still bring up my credit because at the moment each site tells me i have no score. It wouldn’t have much of an impact. The goal to boost your credit score is to show on-time payments. The more you have, the better off you’ll be. You know anything about the self lender secured credit card? We haven’t – it might be a new product they offer. Before you jump in, compare your options – The Best Secured Credit Cards To Build Credit. The increments appear to have changed since this video, however, $48.50 x 12 months = $582, and you get a pay out of $550. So the interest of $32 doesn’t go into your savings, and instead goes to the company, probably so they will report to credit bureaus. Funny, since that is the only thing the company is doing. Since they don’t actually give you the money to spend upfront like a traditional loan, they are getting paid your interest just to report whether or not you are good at making payments. By my calculations, the cheapest current option is the $44 per month ($1000 total) loan, which costs you $43 in interest and application fees. I’m trying to buy a house in April but my credit will be ran in Jan to start looking . Will this affect me in anyway by opening this account? I was told to be careful opening accounts 6-12 months prior to buying a home. If this will bring my score down before I buy I may need to wait and do this. Checking your own credit isn’t an issue. Loved them at first… made all my payments on time and got to watch my score rise! Then I paid all my dues and finished…. here’s the catch with my account.. I gained 100 points .. but in the end I lost 49 on one and 56 on the other! Where I thought I was ok and finally out of the red I was wrong!! So yeah it helps but in the same sense a secured card made makes more sense!! !